The Ladybug camera has 6 sensing elements – 5 around, and one on top – which give pretty complete full dome coverage. However, the camera generates a lot of data, very quickly, and needs to be connected to a computer for capture. It also requires external power. We found that an Apple MacBook Pro (running Windows) worked exceptionally well for capture. Since we already need to carry a battery pack, adding an external eSATA hard drive gave us a very speedy way to store all the incoming data. With this configuration, we are able to capture full resolution video from the Ladybug at 30 fps – in a mobile configuration, which is great! Everything packs into two Pelican waterproof cases, lined with foam which helps with shock absorption. I would like for everything to be functional without having to move it from the case, but the hard disk and the AC inverter require ventilation. At least they can be set on top of the foam, which absorbs vibration. Mounting the camera on various vehicles posed some challenges. The first was mounting on vehicles, since a lot of modern cars don’t have a lot of obvious flanges to hook into. We used hook anchors from a Cinekinetic CineSaddle, as well as the rope that came with it. I placed a Gitzo tripod with legs in the widest position on the roof the vehicle, passed the rope through the anchors, and wrapped it around the tripod pole from every direction. Finally, after securing the ropes, I extended the legs of the tripod to firmly tense it against the ropes. With some variations, this is what we did for all further shots from cars or vans. Next challenge was mounting the Ladybug on a boat. For this, we had a counterweight mount from Horizon True, a device that attempts to keep a camera level. 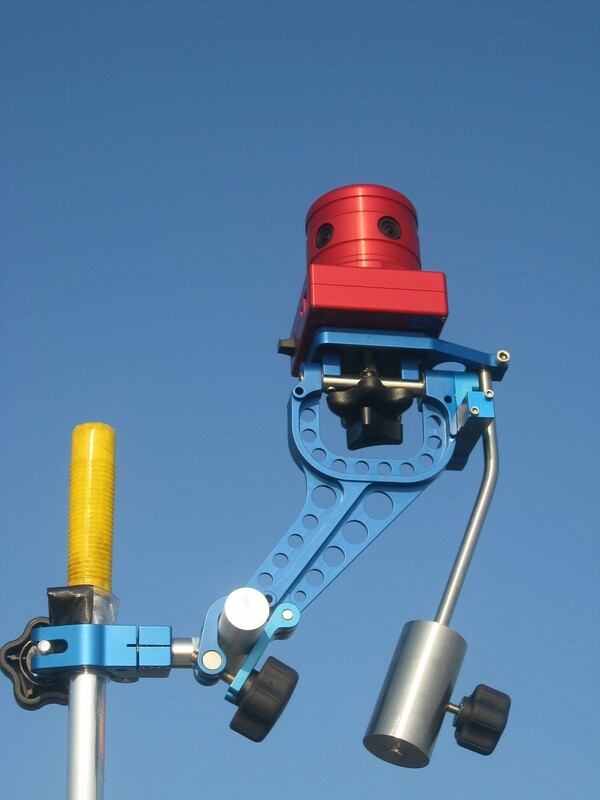 However, it wasn’t just the levelling capabilities that were important: the Horizon True mount comes with clamps that allow mounting a camera on to any kind of vertical or horizontal pole, and this came in extremely handy. For the first boat trip, the mount was attached to an aluminum mop handle, clamped to the boat’s windshield rail using fence clamps. This mounting system worked relatively well, though I suspect it is probably best when used on a sailboat. It tended to pick up motion very quickly when the boat was not in motion, and rolling a lot. I think it may be possible to attenuate this by adjusting the position of the counterweight, and maybe the hydraulic damping. 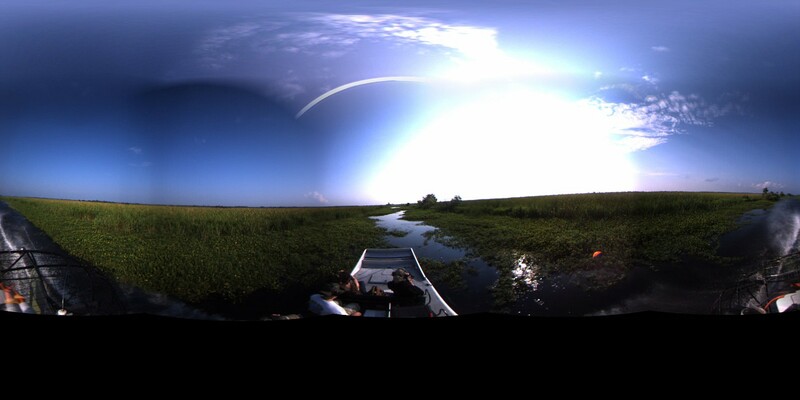 The next big challenge was mounting on an airboat, a shallow-draft boat with a big propeller on the back, widely used for swamps and marshes since it can cruise over vegetation (and even on land, for short distances). I thought the airboat would be a challenge, due to the speed and vibration, so I wanted a very solid mount. 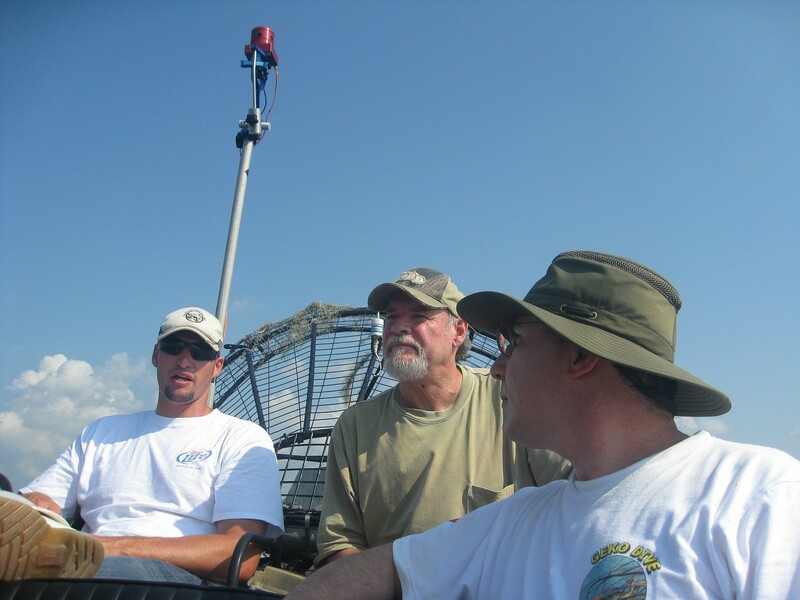 Fortunately, the owner of the airboat procured a sturdy pipe for us to use as a mast, which I attached to the propeller cage using the same fence clamps as before. The Horizon True mount worked well here too, though it became somewhat unstable when buffeted by the wind. 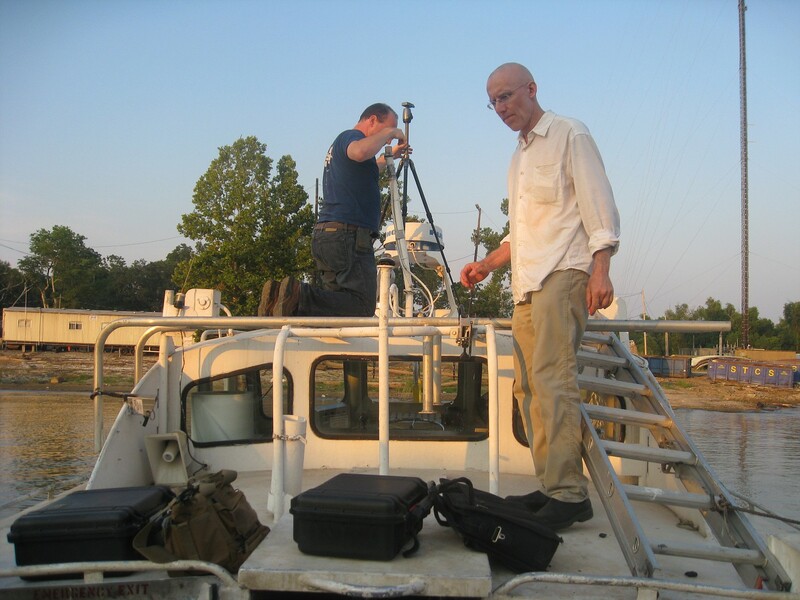 Mounting on a Mississippi river crewboat was straightforward: the tripod was set up on the roof of the boat’s cabin, and secured using a tie-down strap from the CineSaddle. 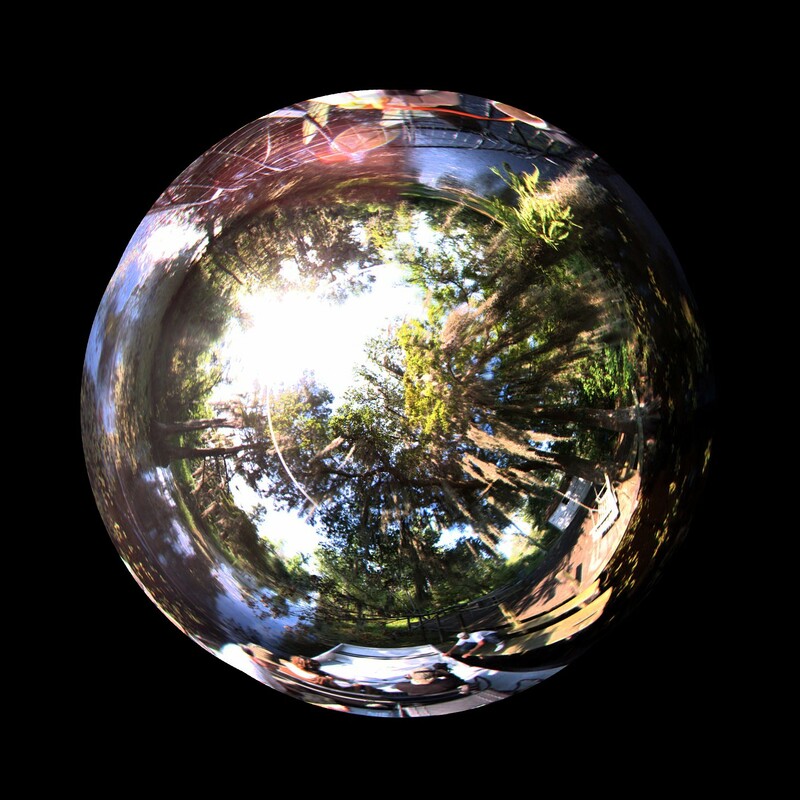 Start viewing from here to see some sample frames, rendered both as a dome projection and as a 360 degree panorama. Note that falloff and vignette correction has not been applied yet. A simple kit of parts including hooks for cars, rope, tie-down straps and clamps let us handle practically all of the mounting situations we encountered. Being able to tie good knots is essential. I’ll be posting further as the project moves further, including some examples of the video. Gian Pablo’s Immersive Video Project » NYC Resistor » Electronics, Hacking, Classes, and Workspace. 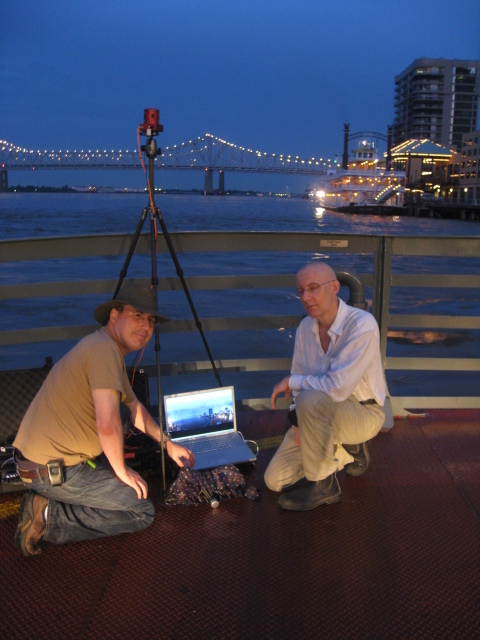 “Below Sea Level” panoramic video project at Mass MoCA » NYC Resistor » Electronics, Hacking, Classes, and Workspace.